PARK STREET AUTOMOTIVE INC. OPENED IT’S DOORS IN MAY OF 1995–IT HAS BEEN OWNED AND OPERATED BY JOE AND RUTH BOLLO SINCE . UPON HIS HIGH SCHOOL GRADUATION JOE ATTENDED WEST CALDWELL VOCATIONAL SCHOOL FOR AUTOMOTIVE TECHNICIAN AND THEN WENT TO WORK FOR HIS UNCLE AT HIS GAS STATION FOR 15 YEARS. DURING THAT TIME HE MARRIED HIS CHILDHOOD SWEETHEART-RUTH RUGGIERO IN 1989 AND IN 1995 THEY OPENED PARK STREET AUTOMOTIVE. RUTH HANDLES ALL THE PAPERWORK, ADVERTISING AND PUBLIC RELATIONS ASSOCIATED WITH RUNNING THE BUSINESS. 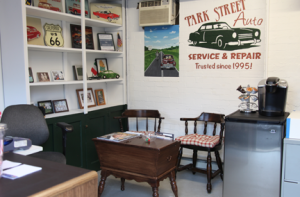 THE COUPLE WORKS CLOSELY TOGETHER ON ALL ASPECTS AND DECISIONS THAT PERTAIN TO PARK STREET AUTOMOTIVE THEY ARE “OLD SCHOOL” RAISED AND BELIEVE IN THE “GOLDEN RULE” WHICH BASICALLY MEANS ” TREAT OTHERS THE WAY YOU WOULD WANT TO BE TREATED”. EVERY EMPLOYEE AND EVERY CLIENT THAT WALKS THROUGH THEIR DOORS GETS TREATED WITH THE UTMOST RESPECT. PARK STREET AUTO HAS A 100% SATISFACTION GUARANTEE ON ALL SERVICES AND REPAIR. WE ACCEPT CHECKS AND ALL MAJOR CREDIT CARDS.